Instituted in 1984, the World Theatre Project is a 13-week in-school residency program that combines the experience of seeing a live performance of a Shakespeare (or other classical) play with in-depth classroom work for students and professional development for teachers. In this program, students develop reading, writing, speaking, listening, and language skills as they explore the play they are learning. Through writing exercises and dramatic activities, students interpret the story in their own voices, inspired by the Theatre for a New Audience production, and bring their work to fruition through the creation of an original performance. The program was designed with the belief that if properly prepared, young people will respond to the timeless themes of classical plays. The Theatre for a New Audience education staff creates a comprehensive curriculum guide for the production on which the program will focus each season. This guide contains 10 artist lessons as well as 10 corresponding teacher lessons, each with their own essential question, lesson aim, vocabulary, and activities. The curriculum guide also contains several useful resources including sample texts, worksheets, and additional activities that teachers may use beyond the scope of the residency. 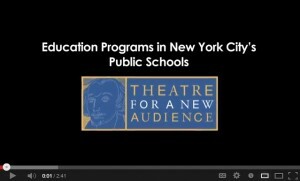 All lessons are hands-on and address the New York City Department of Education’s Blueprint for Teaching and Learning in Theater, and the New York State Common Core Learning Standards for English Language Arts & Literacy (grades 4-12). 10 weekly classroom workshops. A Theatre for a New Audience-trained teaching artist works in partnership with the classroom teacher to lead dramatic activities with the students that teach the plot, themes, language, and characters of the play. The students then become engaged in their own artistic process as they create and rehearse their own original interpretation of the play. Nine hours of professional development workshops for teachers. The teaching artist leads participating teachers through a hands-on exploration of the curriculum guide where they refine strategies that will best serve their students. Additional planning time with the teaching artist enables teachers to craft literacy lessons that support and extend student learning. Attendance at Theatre for a New Audience’s Off-Broadway production of Shakespeare or another classical play. Seen by students in morning matinees, this is the same full production also seen by regular theatergoers. Each matinee is followed by a Q & A with the artists. A Culminating Event. Students create and perform their own interpretation of the play using Shakespeare’s text and their own original writing for parents, administrators, and peers.